Food Inc. is an eye opening documentary by Robert Kenner about the corporate controlled American Food Industry ! 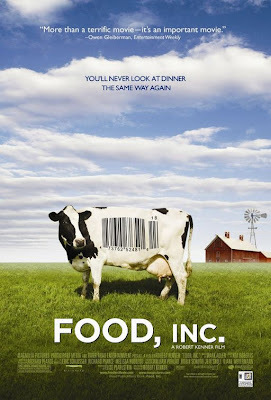 In Food, Inc., filmmaker Robert Kenner lifts the veil on our nation's food industry, exposing the highly mechanized underbelly that has been hidden from the American consumer with the consent of our government's regulatory agencies, USDA and FDA. Our nation's food supply is now controlled by a handful of corporations that often put profit ahead of consumer health, the livelihood of the American farmer, the safety of workers and our own environment. We have bigger-breasted chickens, the perfect pork chop, herbicide-resistant soybean seeds, even tomatoes that won't go bad, but we also have new strains of E. coli—the harmful bacteria that causes illness for an estimated 73,000 Americans annually. We are riddled with widespread obesity, particularly among children, and an epidemic level of diabetes among adults. Featuring interviews with such experts as Eric Schlosser (Fast Food Nation), Michael Pollan (The Omnivore's Dilemma, In Defense of Food: An Eater's Manifesto) along with forward thinking social entrepreneurs like Stonyfield's Gary Hirshberg and Polyface Farms' Joel Salatin, Food, Inc. reveals surprising—and often shocking truths—about what we eat, how it's produced, who we have become as a nation and where we are going from here.